Manager Jim Chapman has made his first move of the January transfer window with the addition of 23 year old winger Jordan Morton. Jordan has joined the club on loan from Airdrieonians until the end of the season. After coming through the youth ranks at Clyde, Jordan was picked up by Hearts at U17 level. He joined Cowdenbeath on loan before heading back to the Edinburgh side to make his debut in the Scottish Cup in 2012. 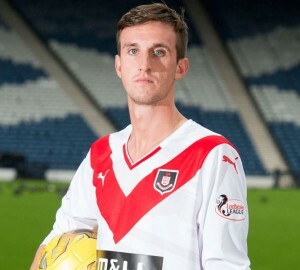 He has since played at Livingston, Cowdenbeath (2nd spell) and Airdrieonians. Striker Jamie Watson has left the the Black and Golds and has signed for Clyde FC after managing only 6 appearances this season. We would like to wish him all the best for the future.